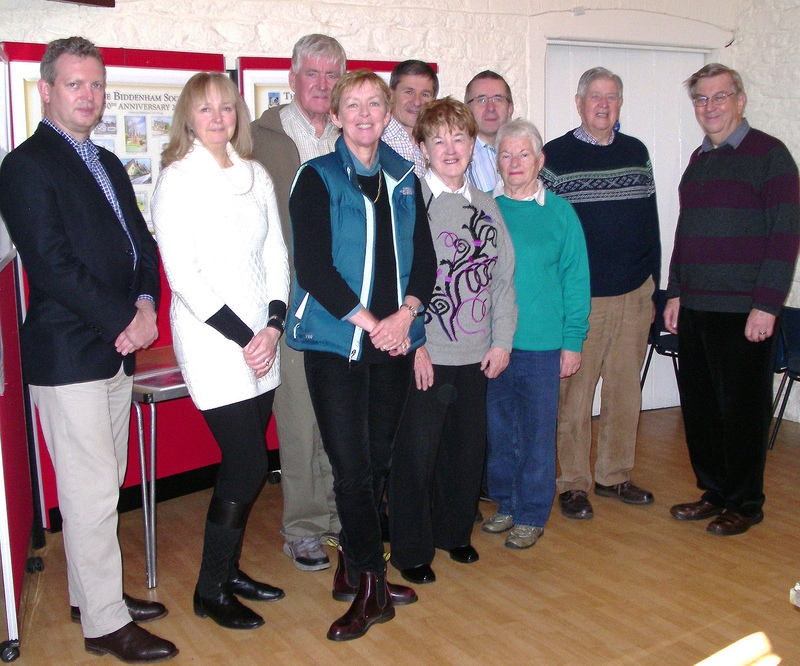 Seventy residents attended the AGM and lunch of the society on 1 November. 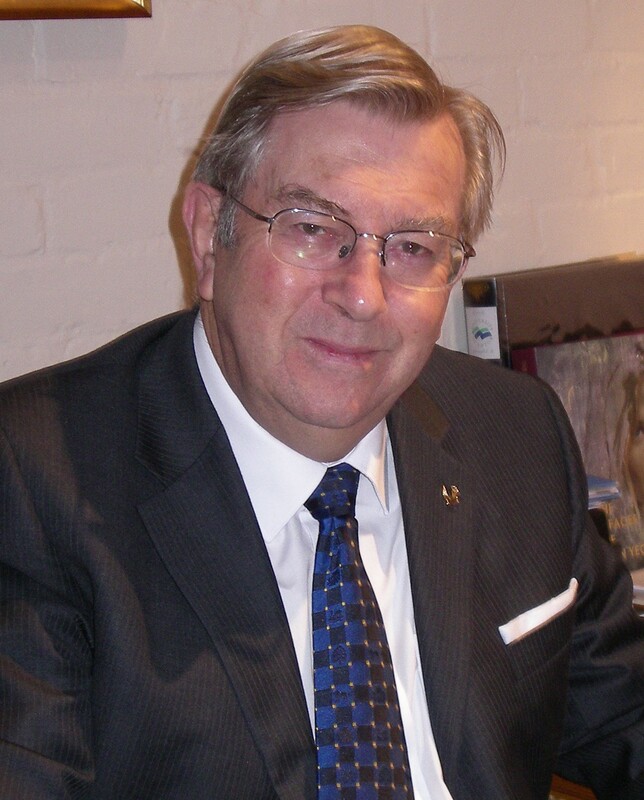 Following a short tribute to the late Doug Kitchen (who served for 29 years on the committee, 21 as chairman), the minutes of the last AGM and the financial report were both presented and accepted by the meeting. The chairman’s report reviewed the planning applications received for Biddenham during the previous twelve months, and presented the outcomes of several of particular interest to residents. The good progress of the northern extension to the western bypass was also raised, with its expected completion in the Spring 2016. The launch of the new Bedford Borough Plan aroused much interest and questions from the floor, as did the borough’s agreement to review the boundaries of the Biddenham Conservation Area for which the society has been lobbying for many years. Jeremy Reynolds and Monica Knight then described a recent inspection visit of two significant Arts and Crafts period gardens in the village by consultants from ‘Historic England’. The meeting re-elected the committee for a further year with the exception of Chris Gleave who was stepping down for personal reasons. In thanking her for her past service, the chairman paid tribute to the outstanding contribution she had made to the preparation and organisation of the annual lunch over many years. Thanks were also given to the committee and the other helpers involved, without whose assistance the event would be unable to take place in its present form. A beautiful sunny, if slightly chilly, morning attracted a bumper attendance of over 150 people to the opening of the new Biddenham Heritage Trail on 18th April, created to commemorate the 50th anniversary of the Biddenham Society. The launch took place on the attractive grass area at Kings Corner, Main Road – a fitting site for the event incorporating as it does a bench seat (restored for the occasion) given by the society to the village in 1995 to commemorate its 30th anniversary. The event began with musical entertainment provided by talented students from Biddenham Upper School, following which the chairman of the society introduced the former MP and current prospective parliamentary candidate for North-East Bedfordshire the Rt Hon Alistair Burt. Mr Burt began by thanking Joe Mummery and Owen Openshaw from the school for their excellent musical contributions, and presented them with tokens of appreciation from the village. He also thanked the Heritage Lottery Fund, whose grants officer Suzie Spence was present, for providing the greater part of the funding needed to establish the trail. He then commended the Biddenham Society for its initiative in developing the project as a way of highlighting the many beautiful aspects of the village to both residents and visitors, thereby encouraging people to respect and help preserve its fine history. He paid tribute to the work of the society over the last 50 years for its constant vigilance in protecting the unique character of Biddenham against undesirable development, and expressed pleasure at the presence of many young people who he hoped would one day continue its good work. Mr Burt opened the trail by unveiling the first of six colourful information boards positioned around the village and in the river valley, each of which contains a map of the main anniversary trail and its various extensions, together with a varied selection of excellent reproductions of paintings of key features created by local artists. Following the opening ceremony, copies of a family trail questionnaire consisting of 24 questions of varied difficulty were distributed with a return date of one week. Many families quickly set off to take up the challenge, and groups were soon to be found all over the village energetically searching for the answers. The winners of the various prizes donated by local organisations will be announced in the June issue of The Loop. A supply of A5 leaflets containing a map of the various routes and the sites of the six information boards plus associated information will be maintained in the village hall entrance area for the convenience of residents and visitors. The map can also be found on the village blog. If you have not yet done so I hope you will take an early opportunity to walk some of the routes for yourself, all of which are colour coded and waymarked. The completion of the overall project will follow the installation of the junior trail board in the grounds of St James’ School. The board has already been manufactured, and is a unique interpretation of the village’s heritage featuring drawings and writing done by the children. Its installation has been delayed following the departure of the previous head teacher, but I expect it to be carried out before the end of May. The total heritage trail project has been completed within budget, with every penny of the lottery grant spent! See the quality – feel the width! Great efforts have been made by contributors and designers to produce visual displays which are not only distinctive compared to similar ventures elsewhere, but are also of high quality. The Biddenham Society wants to ensure this standard is maintained in the future, and that any resulting vandalism or deterioration in information boards or waymarkers is swiftly and effectively corrected. Accordingly, the society is establishing a ‘Heritage Trail Maintenance Fund’ to enable corrective measures to be taken when they are needed. As an initial target we aim to raise £1,000 for this purpose, and thanks to the early generosity of the Biddenham Show Committee plus two local residents we are off to a flying start with £400 already in the bank. If you as an individual, or as part of one of our many thriving village groups, would like to consider making a contribution to this fund, you would be helping to sustain a very concrete expression of the pride in our village we all wish to encourage amongst both residents and visitors. Donations, however small, would be welcomed, and preferably sent to our Honorary Treasurer Bob Hutchinson at ‘Buttercups’, 19 Main Road. 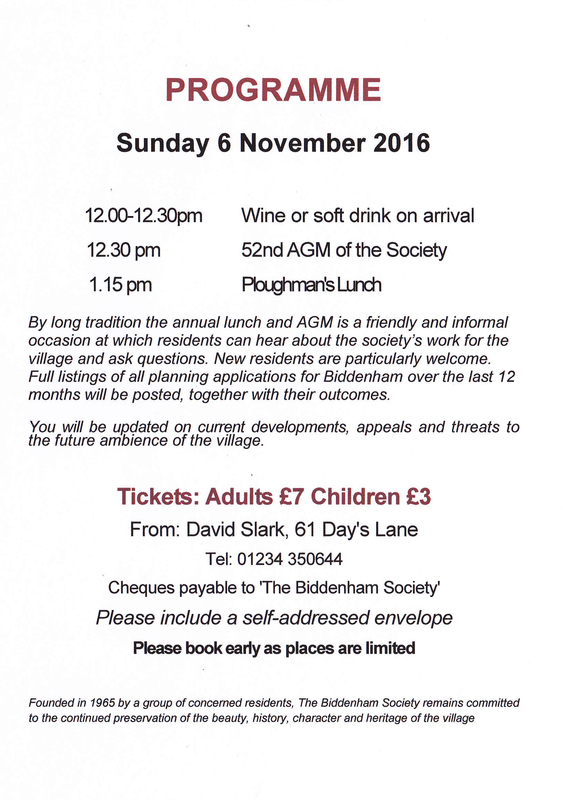 Cheques should be made out to ’The Biddenham Society’. SUPPORT YOUR VILLAGE – BRING THE FAMILY! To what? Why the opening of the Biddenham Heritage Trail of course on Saturday18 April at 11.00am at King’s Corner, Main Road. Festivities will commence at 10.30am with entertainment by some of the talented musicians from Biddenham Upper School under the direction of their tutor Georgina Murphy. Our current (but then prospective candidate) Member of Parliament Alistair Burt will formally open the trail at 11.00 am. There will be balloons for the children and trail maps for everyone, with the different routes colour coded and identified by waymarkers. Other heritage trails exist but not like ours! The Biddenham version really will be a bit special – but then, so is Biddenham! As you follow the trail and any of the three optional extensions (for the energetic) see how many of the natural and man-made features of great historical interest you can identify. Over 30 of these are illustrated in full colour on the six information boards which will be positioned around the village and the surrounding area, in the form of reproductions of a selection of the 54 original paintings done specially for the occasion by village artists. We want this to be a real family event, so bring the children and/or grandchildren, and take the Heritage Challenge. This is in the form of a special Family Trail Questionnaire, the answers to which can all be found by following the main Anniversary route of about 1.5 miles in length through the historical parts of Biddenham. There is no need to go further afield. Some questions are easy (children) and some more difficult (adults) – or should it be the other way round? Prizes donated by local organisations will be awarded for correct or near-correct entries. The questionnaires will be available immediately following the opening ceremony, but if you can’t spare the time to take the challenge on the day itself you will have a week in which to do so and to submit your family entry. Come on! Note the date, and help give this initiative a flying start.